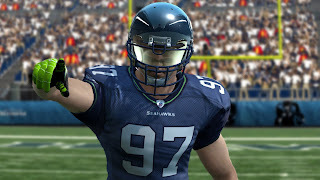 Since Dom and Joey’s sports prowess is *cough* lacking, they needed my expertise to review the biggest video game of the year, Madden NFL 10. This is a game that I anticipate moments after the NFL season wraps up, scouring the internet, pouring over screenshots, reading every blog I can for any scrap of information of the next installment. This year, my patience, has been rewarded with a very polished and extremely well done product. 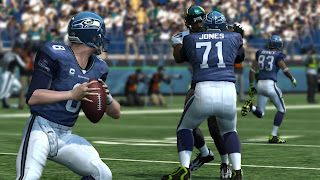 Just looking at the cover of the game, gives me something to look forward to; the Madden curse. If you're not familiar, the Madden curse, is the belief that every cover athlete will have a horrendous season or become injured, etc. This year the cover athletes are Larry Fitzgerald (Arizona Cardinals) and Troy Polamalu (Pittsburgh Steelers), of my two least favorite teams. 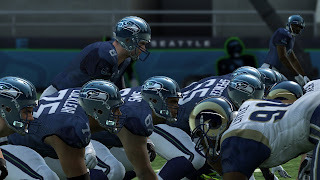 From the second you fire up your first game within Madden you will see an instant difference in the presentation of the game and a new level of realism. 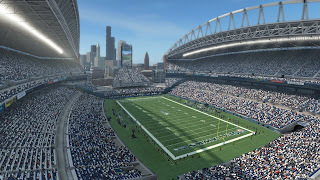 Games start with an outside shot of the stadium and zoom to fans buying merchandise and concessions within the stadium. The coolest part of the pre-game presentation is showing the star players of the home team with their helmets off, standing for the national anthem while Airforce jets fly over head. They've also added a more realistic broadcast touch by giving a real TV-like sign out at the end of the game. This year, they've slowed down the pace of the gameplay to make for a more realistic speed for the players, and also make their moves seem more fluid. 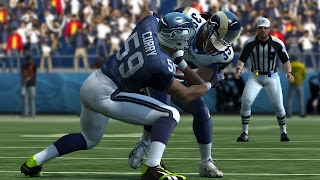 The biggest feature add in Madden NFL 10 is the Pro-Tak tackling system that causes the player to “fight for every yard”. It just means that instead of the ball carrier just falling down when tackled he will fight to stay up and sometimes even fight off the tackle for more yards. They also added multi-player tackles and players even fight for the ball in the scrum, adding several additional layers to the realism. The franchise mode is by far the most important aspect of the game for me (yep, I’m an armchair GM). This year’s franchise mode has its ups and downs, but overall I am ok with the finished product. They removed the ability to improve players through weekly drills and instead give every player a potential grade (A-F system), that will determine how good a player can get in their career. Other factors that play a role in play progression are age and how they did the previous season. Overall (Mashbuttons) I give the game a 9 out of 10. The realism of the game play is above and beyond what I’ve ever seen in any sports game. The franchise mode isn’t great but it’s still really good (but then again I am really picky when it comes to the mode). Finally, the soundtrack is great, including a lot of 80’s rock and even a Slipknot song (big plus with me).